While not the actual rollover of the pickup in this crash, it is a similar one in a recent DUI rollover. They usually have about the same outcome – people are injured and killed. The driver whines about having to remember their lost friends for the rest of their lives – boo hoo – and the family of the dead kid has a graveyard to visit every year to place flowers on the kid’s birthday. Ride with an impaired driver, buy a ticket to your own funeral. VEHICLE #1 WAS SOUTHBOUND NORTH WENAS ROAD, ENTERED CURVE, LEFT ROADWAY TO THE RIGHT. VEHICLE ROLLED, CAME TO REST IN A FIELD. ONE SUBJECT EJECTED FROM BED OF PICKUP. KLICKITAT COUNTY, Wash. — Washington State Patrol says two teenagers from Yakima County and at least three others were injured in a suspected DUI crash in the Columbia Gorge Friday morning. It happened just before 5 a.m. on State Route 14 east of Bingen. 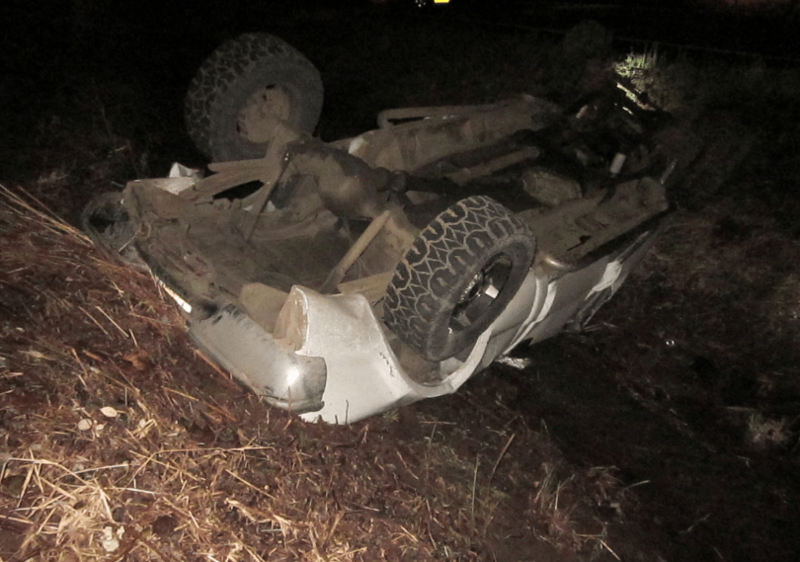 Troopers say the teens’ pickup left the roadway, hit a rock embankment and rolled into a ditch. The driver was identified as 18-year-old Kurtis Smartlowit of Toppenish. He and four passengers were taken to a hospital in The Dalles, Oregon. A 15-year-old Wapato boy was then taken to Portland for treatment. This entry was posted in DWI Arrests by State, DWI crash photos, Illegal drugs, impaired driving with minors in vehicle, injury or death and tagged Driving Under the Influence, driving while impaired, driving while intoxicated, drunk driving, DUI, DUI suspected in crash, DWI, Jose L. Saaedra, OWI, rollover of pickup in Yakima, Ryan W. Jahr-Gibson, Sarah L. Huntley driver in DUI wreck, Washington State Patrol, Washington: State Patrol reports 6 hurt in DUI crash; DUI charges pending against Sarah L. Huntley-Fife, Yakima County, Yakima Memorial Hospital. Bookmark the permalink.